You have an inspiring cause, a great venue, awesome speakers, and incredible food. But how do you actually get people in the seats? Too many 501(c)(3)s feel their efforts are wasted on events for their organization. What they don’t realize is that events are an extremely effective way to network, spark interest in your mission, and gain support. 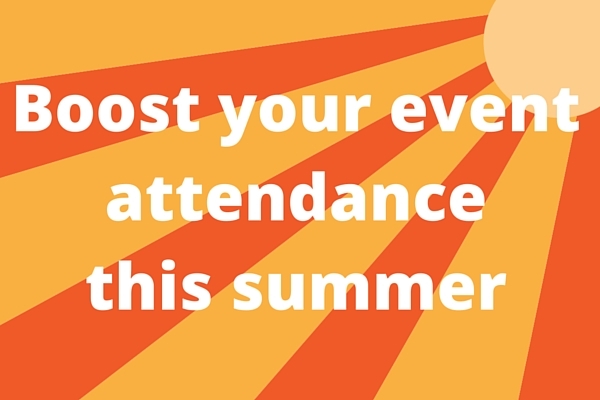 Here are ways to boost your non-profit’s event attendance this summer. Social media is a great way to get the word out about your organization’s events. Facebook, especially is an exceptional platform to use for this. Create an event, and invite everyone on your friend list. State the mission of your group, what the proceeds will go to, and be sure to give your friends incentives to attend (great food, door prizes, etc). Make your event public, and encourage your friends to “share” the event on their profiles – the more people who see the event, the better! Speaking of Facebook, you should also create a Facebook profile for your non-profit, too. Invite your friends to like that page, as well. Did you know that Google offers a grant to eligible 501(c)(3) organizations valued at up to $120,000 a year? It’s true! The grant allows non-profits to advertise their organization on Google. This causes mass visibility for charities, and it causes people to learn about your group when they visit Google. Additionally, the grant is available in mass quantities, meaning most organizations who apply for the grant can receive it; it is not as competitive as other grants are. The Ad Grant is a cost effective way for your organization to advertise your mission and gain event attendance. The benefits of the Google Ad Grant are truly incredible and immeasurable! Do you have a list of folks who have signed up, in order to stay up to date with your group? If so, it’s time to put that list to use! It is really very valuable to have a potential supporters email address, because they have already expressed an interest in your organization. Develop an email marketing strategy, and do some further legwork: Research to learn about best practices, when/what time of day to send emails, how to write enticing subject lines, and how to write effective content. When you do speak about events, write passionately about how their participation will effect the cause. As with the social media approach, make sure to mention “what’s in it” for those who do attend. Make your event as irresistible as you can. It goes without saying that you need to promote your event on your group’s website homepage. And on your site, you need to make it as easy and straightforward as possible for them to sign up for the event/purchase tickets. Too often, non-profits create lengthy, drawn out, and unclear directives on how to register for their events, and this results in people getting frustrated or bored – which causes them to abandon your site without registering for the event. Talk about the event on your homepage, above the fold, if possible. Make it visually appealing, use clear images, and create an enticing and clear call-to-action (CTA). Create a “sign up now” button that links directly to a page where they can register for the event. Remember, make this process as easy and short as possible. Promoting events can be especially challenging and time-consuming. However, we hope our suggestions will help yours be more successful. Contact us to learn more about promoting events for your non-profit! This article was posted in Campaigns, Uncategorized and tagged campaigns, events, grants, how to, marketing, non-profit, nonprofit, Tips. We couldn’t have found a better way to get the word out about the atrocities of human trafficking than online advertising using the Ad Grants Program. It’s been a remarkable program for our spreading the word and engaging people to help with our cause. I can tell you that website traffic has increased by 119% and we are setting record numbers for volunteer recruitment. Thanks to you and some of our additional promotions, we’re very happy with the progress we’ve made online & in the media. We received a grant worth $120,000 for online advertising, with idGrant's help. The Ad Grants for Nonprofits sponsorship program increased my online visitors by more than 3,000 new visitors in the first three months. We increased our newsletter subscription rate by more than 300% with the first three months of the Ad Grants for Nonprofits Program. (c) Bashpole Software, Inc. /dba/ idGrants. All Rights Reserved.